Beginning Saturday, Feb. 24, Billy Graham’s body will travel to places important in his life and ministry before he is laid to rest on Friday, March 2. On Saturday, Feb. 24, the immediate family had a private prayer service at the Billy Graham Training Center at The Cove in Asheville, North Carolina, before a motorcade transported Graham’s body to the the Billy Graham Library in Charlotte, where he will lie in repose. The journey took around three and a half hours, leaving The Cove around 11:30 a.m. and arriving at the Billy Graham Library around 3 p.m. The route passed by LifeWay’s Ridgecrest Conference Center, where flowers adorn a statue of Graham. Monday, Feb. 26, and Tuesday, Feb. 27, the casket was placed in the Graham Family Homeplace—the childhood home of Billy Graham that was moved to the grounds of the Billy Graham Library. The public was invited to pay their respects from 8 a.m. to 10 p.m. both days. Graham’s plywood casket, crafted by inmates at Louisiana’s Angola Prison, remained closed. Former president George W. Bush and his wife, Laura, visited the Billy Graham Library Monday, Feb. 26 to pay their respects. #Repost @bgea ・・・ Former President George W. Bush and first lady Laura Bush visited @thebglibrary today to pay their respects to Mr. Graham. After time in the Billy Graham Homeplace with Franklin and Jane Graham, Bush gave a short statement: "If there's such a thing as a humble shepherd of the Lord, @billygraham is that person. I am unbelievably blessed to have met him," he said. "I also had the honor of bringing my Mother and Dad's greetings to Franklin and the family. #BillyGraham and Dad were great buddies. 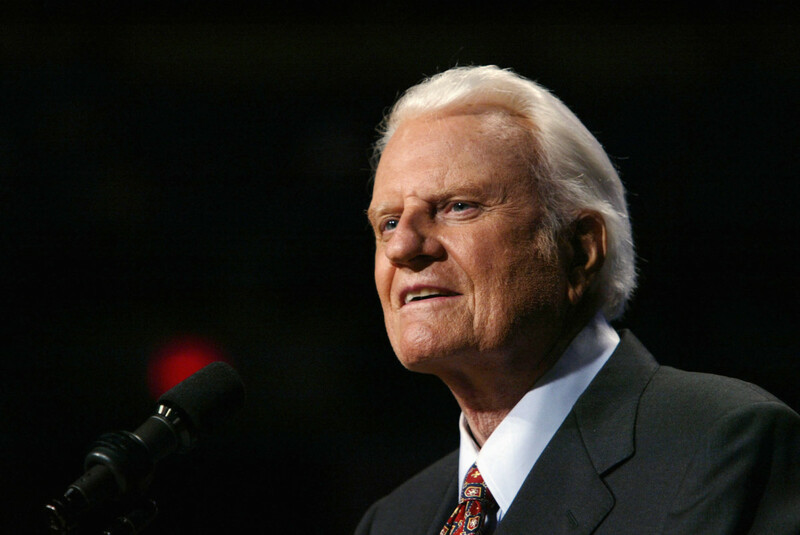 … God bless Billy Graham." Bill Clinton visited Tuesday, Feb. 27. Graham’s body was flown to Washington, D.C., where he lay in honor in the U.S. Capitol Rotunda on Wednesday, Feb. 28 and Thursday, March 1. He is only the fourth private citizen to have this distinction. Upon Graham’s arrival at the Rotunda, House Speaker Paul Ryan and Senate Majority Leader Mitch McConnell led a bicameral service honoring the evangelist. Graham’s casket will be returned to Charlotte, where a private funeral service will be held Friday, March 2, on the grounds of the Billy Graham Library. He will be buried next to his wife, Ruth, in the Library’s Prayer Garden. Among the 2,300 invited to attend the service are President Donald Trump and Vice President Mike Pence, along with living former presidents. The service will take place in the Library parking lot under a large tent—a nod to the beginnings of Graham’s public ministry. Among those scheduled to speak at the funeral are Graham’s children. We will have more information here as it becomes available.